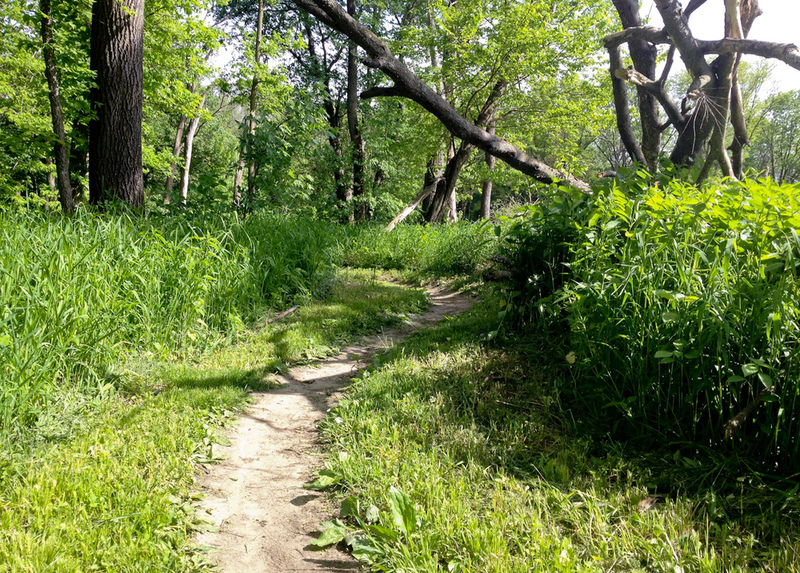 Fast, flowing singletrack through the urban forest, smack in the middle of Des Moines. Center Trails boasts around 13 miles of trail segments. They range from easy to moderately challenging. Most are fast, flowing single track through woods while Hillside provides some nice climbs and descents as it weaves around several ridges. Center Trails wind through Greenwood/Ashworth Park (Rollercoaster, Hillside) and continues south of the railroad track and across Walnut Creek in the Raccoon River flood plain (Denman's Woods, Rhythm, and Squirrel's Nest, J11). Be considerate of the trails in the low-lying areas. During spring time thaw and heavy rains the trails are often closed. Signs at the trail heads will indicate whether a trail is open or closed and regularly updated by the Trail Steward. A suggested run starts at the trail head just south of the Ashworth Pool parking lot. Start on the trail and go left, up the hill behind the pool. At the 45th St. road crossing, jump over to the continuation near the ampitheatre. Follow this around behind the art center, ridges and back down to the creek crossing. Head straight after the creek which puts you out onto the Bill Riley paved trail. Head right, down Bill Riley for 20-30 yards and you will find Hillside's entrance on your left. Once you're done with Hillside (you will end up where you originally entered), ride down Bill Riley and around to the Walnut Creek trail (you can take the short-cut through the woods and over the rail-road track - it's off to the right south of the parking lot, and bisects near where you crossed the creek). When the Walnut Creek trail reaches North Valley Drive (Walnut Creek will be on your left), turn left (south) over Walnut Creek. Make a left onto the levee path. From the levee (or the singletrack that runs along the creek), look for Denman's Woods entrance just below the levee when the path jogs right and heads south. Plunge down the levee into the woods and enjoy! Greenwood Park is centrally located, south of the Des Moines Art Center off Grand Avenue and about 45th St. If you are driving, park at the Ashworth Pool. The trailhead is just off the Bill Riley Trail on the south side of the parking lot. The Ashworth Pool has a water fountain, but is only open during summer hours. An air pump and bike maintenance tool unit is available at the south side of the Ashworth Pool parking lot at the Bill Riley trail head. This trail contains several climbs and fast descents, along with free-ride bridges (no railings). Old growth tree roots provide some technical challenge, but overall the trail flows fast and has some nice ups and downs when you get your pace. Hillside is really a continuation of the new Greenwood Park improvements which fluidly connect Rollercoaster and Hillside. Hillside is primarily the hilly bit that follows the contours of the ridges on the southeast side of the park. Hillside provides some of Des Moines largest climbs (and that's not saying much, it's pretty flat around here), but with the trail improvements (Spring 2015) the flow of this trail has improved. Challenging climbs, and fast descents are the reward. J11 is a quick little run south of the Walnut Creek Trail that takes you through the woods and along Walnut Creek. Just across the creek is Denman's Woods. 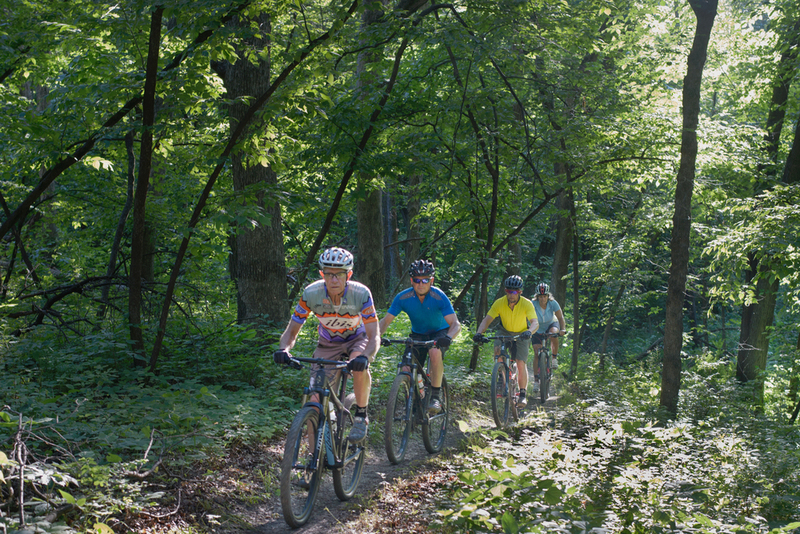 Denman's Woods is a singletrack loop that winds through the woods along the south side of Walnut Creek. It rides fast enough to flow nicely, and enough variety to keep you on your toes. 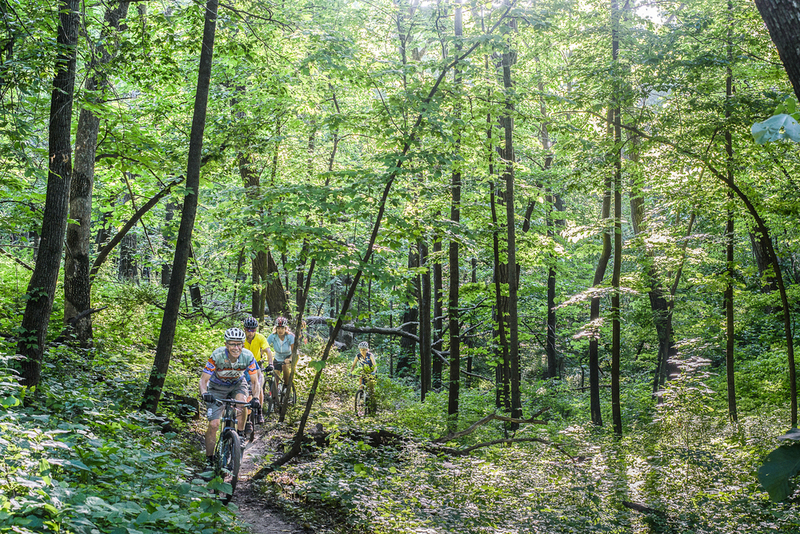 The connector is a singletrack proxy that connects Denman's, Rhythm, and Squirrel's Nest. It runs from where the railroad bridge crosses Walnut Creek (near Rhythm) and runs parallel to the railroad down to the levee (near Denman's Woods). 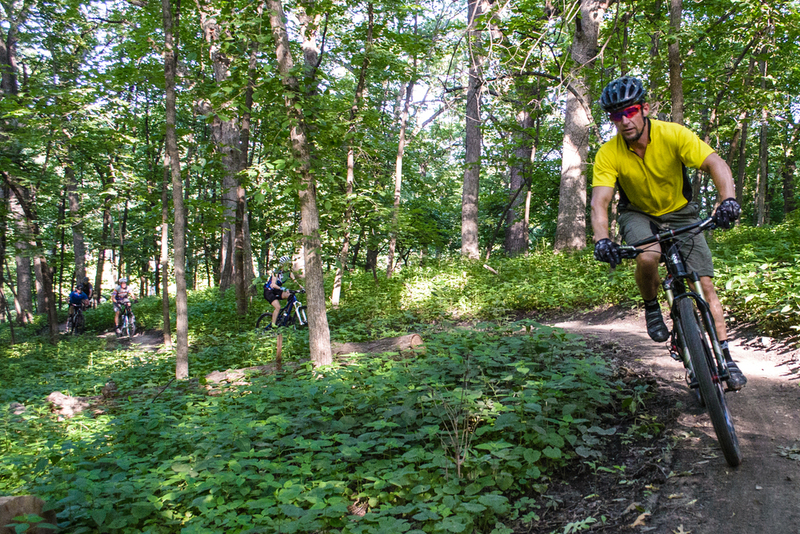 Squirrel's Nest is a singletrack loop that takes you through the woods and along the Raccoon River. 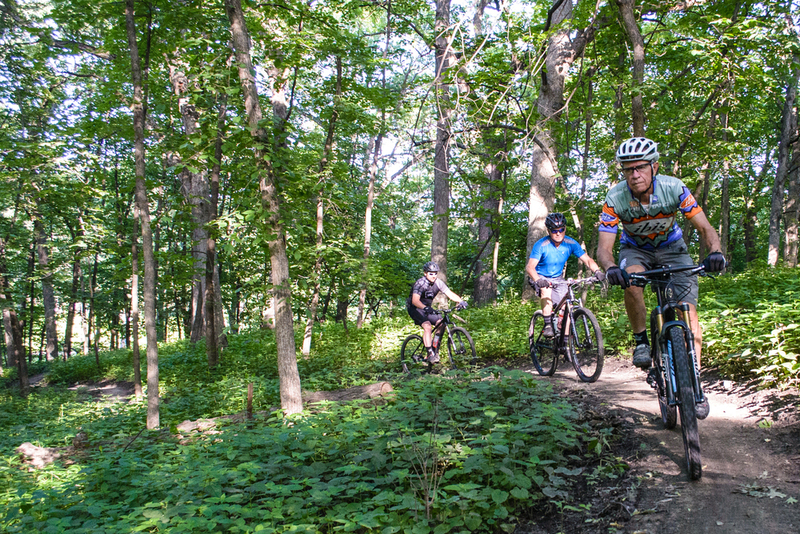 Rhythm is a singletrack loop that takes you out along Walnut Creek, into the woods and along the Raccoon River.